FILE - A Turkish army tank takes up position on the Turkish-Syrian border near the southeastern town of Suruc in Sanliurfa province, Sept. 29, 2014. Kurdish officials in Syria say any Turkish military action against them would affect their efforts in defeating Islamic State in its last stronghold in the country. “This is a clear declaration of war,” Nuri Mahmud, a YPG spokesperson, told VOA. “We take Erdogan’s threats against us very seriously. He has repeatedly expressed his desire to occupy our land in northeast Syria." The United States maintains a military presence in areas under the control of Kurdish forces in Syria, which has been instrumental in the ongoing fight against the Islamic State (IS) terror group. There are about 2,000 U.S. troops on the ground, U.S. defense officials say. 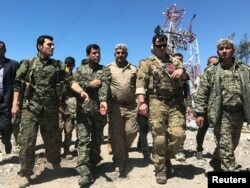 FILE - A U.S. military commander, second from right, walks with Kurdish fighters from the People's Protection Units (YPG) at Mount Karachok near Malikiya, Syria, April 25, 2017. Turkey views the YPG as an extension of the Turkey-based Kurdistan Workers Party (PKK), which has been engaged in a bloody war with the Turkish military for three decades. Both Ankara and Washington consider the PKK a terrorist organization. The U.S. makes a distinction between the PKK and YPG, however, providing military support to the latter in its fight against IS militants in Syria. Analysts in Turkey say Erdogan’s recent comments regarding the YPG shouldn’t be taken lightly. The YPG is the main group within the Syrian Democratic Forces (SDF), which now controls more than a quarter of Syria’s territory. In recent months, Turkish forces have carried out a series of attacks against YPG positions in Syria. Hoping to prevent further altercations between the Turkish military and Kurdish forces in Syria, the U.S. last month said it was setting up at least five observation posts along the Syria-Turkey border. On Tuesday, the Pentagon said U.S. observation posts in northern Syria have been set up, despite Ankara's objections. “At the direction of Secretary [Jim] Mattis, the U.S. established observation posts in the northeast Syria border region to address the security concerns of our NATO ally Turkey,” Pentagon spokesman Rob Manning told reporters. The U.S. repeatedly has asked Turkey and Syrian Kurds to put their differences aside and instead focus on the war against IS. But analysts say Turkey’s opposition to the observation posts is derived from Ankara’s firm belief that such observation posts were built to protect Syrian Kurds. “Erdogan has lost hope that the U.S. would stop its support for SDF, particularly since the U.S. observation points along the Syria-Turkey border have become a reality,” said John Saleh, a Syrian affairs analyst in Washington. “Erdogan genuinely fears that the U.S. support for Syrian Kurdish forces might continue even after the war on IS is over,” he told VOA. 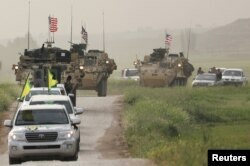 FILE - Kurdish fighters from the People's Protection Units (YPG) head a convoy of U.S military vehicles in the town of Darbasiya next to the Turkish border, Syria, April 28, 2017. Other analysts, like Kyle Orton, who is a Syria researcher in London, believe that while Turkey is capable of carrying out an attack in northeastern Syria, Erdogan’s rhetoric has generally been cautious regarding Syria, especially in areas where there is a U.S. presence. “This is more a messaging effort to push back against the U.S. claim that these border posts were for Turkey's protection, rather than, as is clearly the case, to protect the SDF from Turkey,” he told VOA. Nicholas Heras, a Middle East researcher at the Center for a New American Security (CNAS), echoes Orton’s assessment and charges that Turkey’s warnings are mere rhetoric. “Ambassador Jeffrey [U.S. Special Envoy to Syria] has also been working furiously to keep Turkey out of areas east of the Euphrates by trying to push forward the idea of power sharing between the SDF and Turkish-backed opposition in disputed areas of northern and eastern Syria,” he added. Dorian Jones contributed to this story from Istanbul.